Looking for a strong and long lasting stay connector? 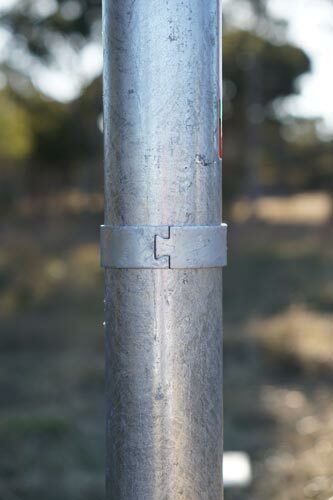 Our heavy duty hot dipped galvanised Twist-Tight post and stay connectors will keep you fences standing and secure. Do you want a simple to install and strong stay connector? Our twist tight post and stay connectors allow you to securely connect a wide range of post and stay sizes with our unique design. The connector consists of a bolt on clamp and a Twist-Tight tongue. Rather than flat, the Twist-Tight™ tongue is twisted. This twist covers the whole inside of the stay, resulting in a stronger and more secure hold. The tongue is tapered at one end so it is easy to install. It then widens at the base and locks in. We have also added a disk at the base to stop water and spiders from getting into your stay. The tongue itself can be used in wooden posts, or connected to a steel post using our clamps. Our clamps can easily be wrapped around the post then tightened and connected to the tongue using a single nut and bolt. It's quick and easy to install and you can run as many stays as you want at any angle. 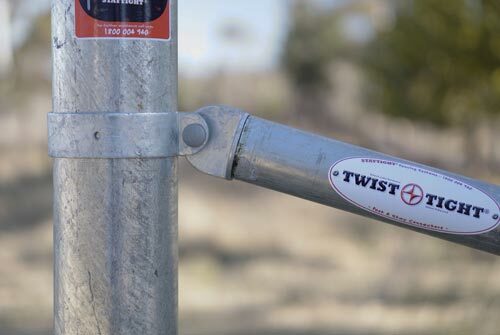 The Twist-Tight post and stay connectors have been designed specifically for farm fences, not security fences. Made from steel, then hot dipped galvanised, you get a strong stay connector that lasts. One bolt secures the tongue and clamps down onto the post. A bolt is far more secure than just pushing a stay into a pre-drilled hole. The tongue also goes 125mm down into the stay, significantly increasing the strength and effectiveness of the clamp. 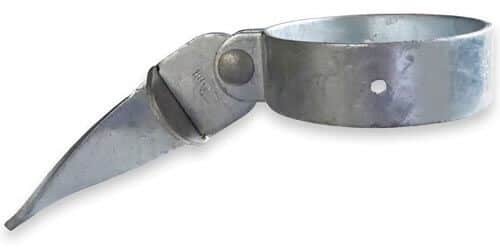 The smooth, interlocking design of the Twist-Tight clamp eliminates the risk of livestock damage. These clamps don't require hauling around a welder, or drilling holes into your steel fence post (which could lead to water getting in and rusting your post). All that is needed to install a Twist-Tight clamp is a shifter. It couldn’t be easier. Compared to alternative options the Twist-Tight clamp is the most flexible, allowing for adjustment at any stage of the fences lifespan. It can easily be set at any height and angle around your post. This is not possible with stay that has been welded or inserted into pre-drilled holes. WHAT'S INCLUDED: The round post clamp, stay tongue and one nut and bolt. A common challenge many people have is picking the right tongue for their stay pipes. One factor you will need to consider is, as your stay pipe walls thicken the tongue size gets smaller. This is why we have several different tongue sizes. Before buying your stay connector, measure the outside diameter and thickness of your stay pipe. Refer to the Stay Ø and Stay Wall Thickness in the above specification table to find which stay connector is best for you. Once you have found the right stay, double check your upright Post Ø for the correct round post clamp. If you have not yet purchased your stay post, 40NB is a good alround size for most applications. If you need something heavy duty go for 50NB. Click here for more information on steel pipe sizes. Warning: Be Careful of 90NB Pipe! The problem arises when you try to get an end assembly or clamp for a 90NB post and none fit! It can be difficult to find good clamps for 90NB fence posts in Australia. So how can you check what pipes you have? ​Refer to our pipe sizing chart. In this video we show you how to install our complete drive tight end assembly including the stay connector. Jump 2:38 to see how to install the stay post connector to your steel post and stay.